This easy Chicken Satay recipe is SO delicious you will want to make it on repeat! Chicken and veggies are grilled to perfection and brushed with the best peanut sauce EVER. It’s the perfect heathy recipe to serve for dinner or to meal prep and enjoy all week long! Heyyy there! I’m finally sharing another main dish recipe with you! Because I want to be helpful and show you our family’s favorite recipes, like this Thai Chicken Satay recipe! In the summer we love to grill. And by we, I mean I prepare the meat/veggies and my husband reigns supreme as the grill master. It’s like a million degrees here, so I love meals like this Chicken Satay with peanut sauce because it keeps all the cooking outside, saving my air conditioning from having to kick it into even higher gear to keep us cool! 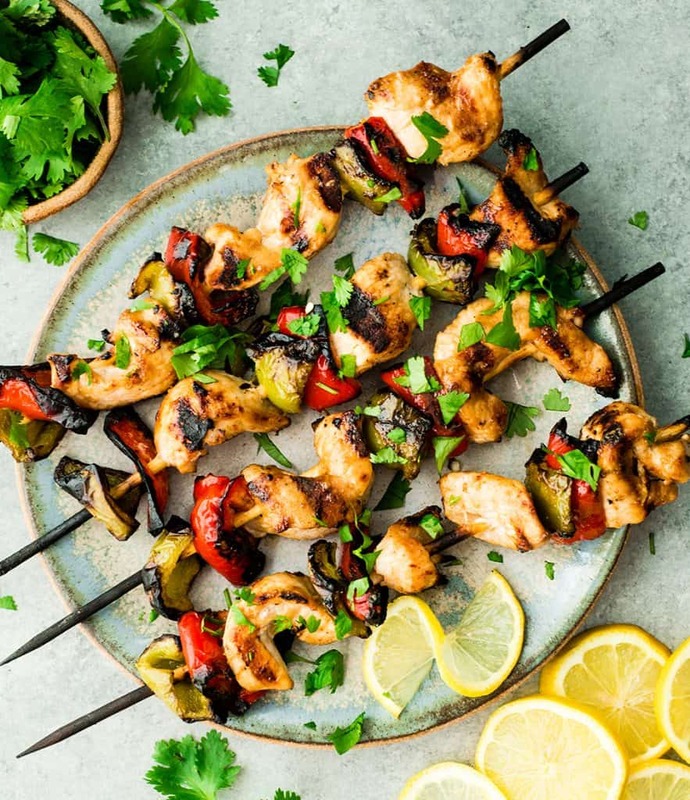 This chicken satay recipe is also super healthy, which makes it the perfect light meal to enjoy after a day of fun in the sun! I actually have quite a few main dish recipes coming up in the next couple of months, because I finally got over my dislike/fear of taking photos of meat. I know it sounds silly, but I am NOT someone who enjoys looking at pictures of meat. When they pop up in my Instagram feed I scroll past as quickly as I can. So, I tried to keep the raw meat photos to a minimum here, only showing you what is helpful! How do you make Chicken Satay? Like I said above, this chicken satay recipe is very easy to make, but I thought we should walk through a few of the steps to ensure your satay success! 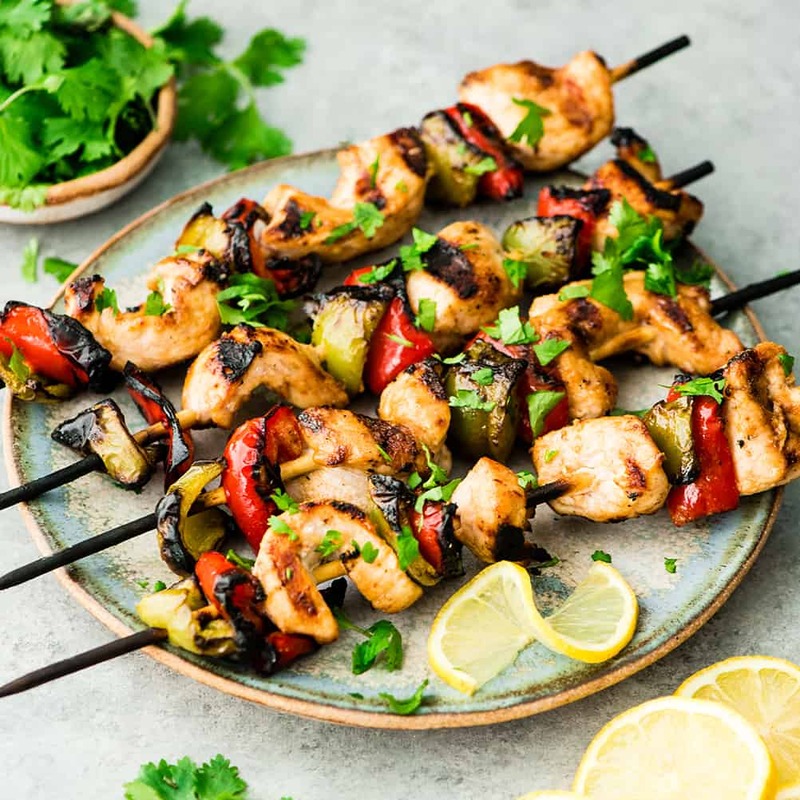 If you plan to make this easy chicken satay recipe as an appetizer, or share it with a group of friends at a BBQ, I recommend using individual bamboo skewers for serving purposes! I always soak bamboo skewers for at least 30-60 minutes before grilling in hot water. This helps prevent the skewers from getting really charred. I L-O-V-E using this flexible fire wire when we make kabobs on the grill. We received this as a gift from a friend, and at first I thought it was totally gimmicky, but it’s SO NOT! I love that they are reusable, dish washer safe, and that you can fit a ton of meat/veggies on each one. I prefer to only use this when I’m cooking for just my family. Because in order to serve I just use tongs and slide the chicken satay into a large bowl and serve it with a spoon! 3. How do you make satay peanut sauce? Gently warm the ingredients for easier mixing. If the peanut butter you use is solid at room temperature, I recommend gently warming the ingredients in the microwave or on the stovetop until they are easy to mix. Only use 3/4 for the marinade, and save the rest. This is super important, because that extra brush of peanut sauce at the end of cooking really takes this chicken satay recipe to the next level! I recommend marinating the chicken in the satay peanut sauce for at least 30 minutes, or up to 6 hours in the refrigerator. You want to ensure that the flavor fully infuses the chicken before grilling! I find that vegetables take longer to grill than chicken. So this chicken satay recipe calls for pre-cooking the bell peppers for 4-5 minutes in the microwave. This ensures the vegetables will be cooked and not just get charred but still be underdone! 6. How long do you grill chicken satay? It really depends on the thickness of your chicken pieces. 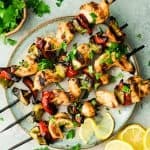 However I recommend grilling this chicken satay for 4 minutes per side, being sure to flip it halfway through (using tongs so you do not burn your hands)! 7. Brush on Peanut Sauce after flipping. 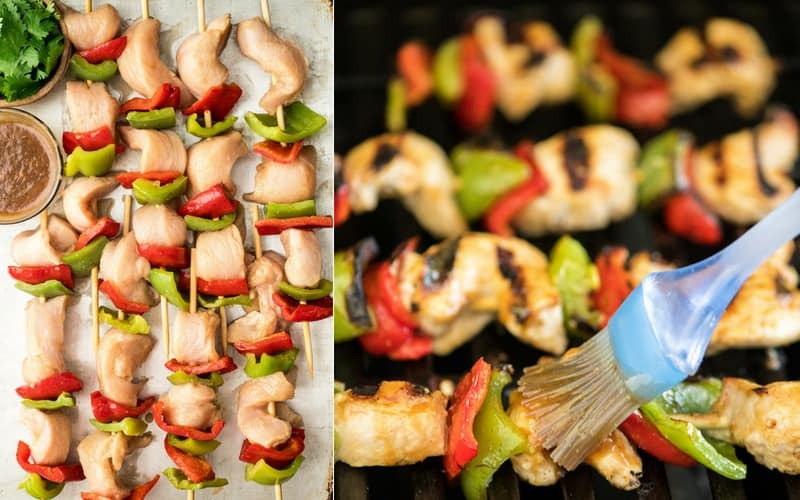 Use a silicone BBQ basting brush to brush the remaining peanut sauce onto the chicken satay kabobs after they have finished cooking on the first side. This will add an extra boost of flavor that is really essential to this dish! 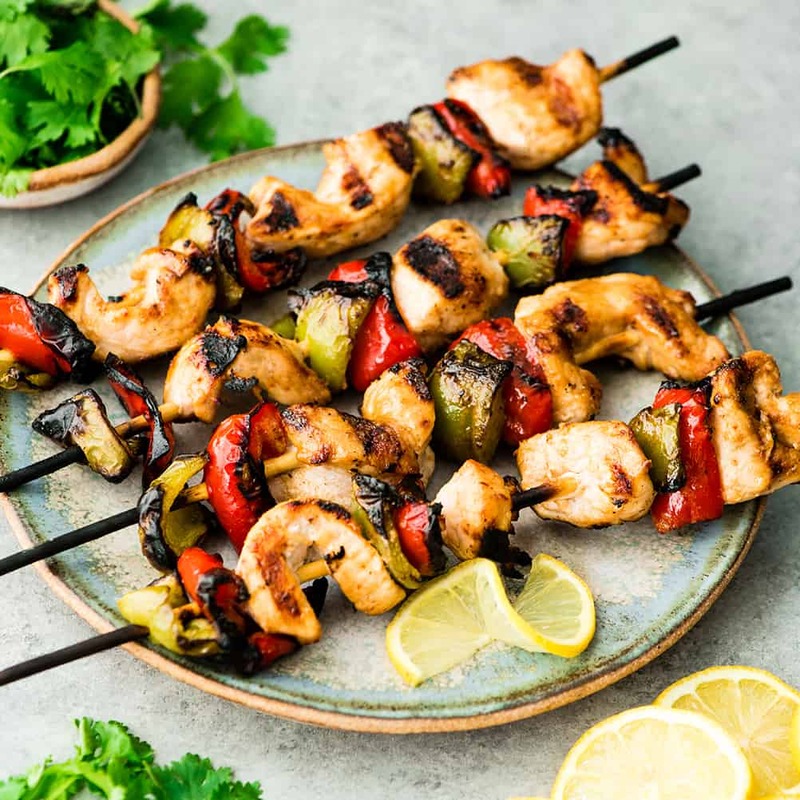 Ok, I thought I’d share a few of our favorite grilling gadgets, that are super helpful when making this chicken satay recipe! Fire Wire. I already waxed on (above) about how much we love this flexible fire wire when we make kabobs on the grill. I have had it for 7 years now and I use it all. the. time. Silicone Brush. Again, I mentioned this above, but using a sSilicone pastry/grill brush is far superior to a regular “bristled” brush. You don’t have to worry about brush hairs on your food (gross) and the silicone can withstand the highest temperatures! I’m all about the sauce when it comes to BBQing, so I use this just about every time we fire up our grill! Here are a few notes about the ingredients and possible substitutions for this chicken satay recipe! Bell Peppers. Feel free to omit the peppers if you want to make this recipe solely chicken satay (and not chicken + veggies)! Other veggies can also be substitutes if you’re not a fan of peppers! Some suggestions: zucchini, potatoes, onions, mushrooms, etc. Peanut oil. 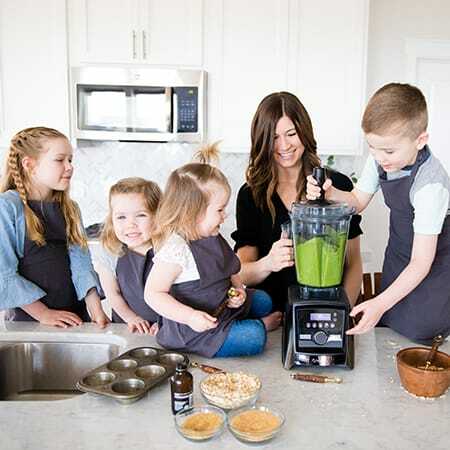 Olive oil or avocado oil can be used in place of peanut oil. However, I love the flavor imparted by peanut oil and do not recommend leaving it out! Soy Sauce. Coconut aminos can be used in place of soy sauce on the occasion that there is a soy allergy in your family! Brown sugar. Coconut sugar or honey can be used in place of brown sugar! Powdered spices (ginger, garlic and onion powder). The real thing can be substituted for the powders in every occasion…minced garlic, minced ginger, minced onion, etc. At least one hour before cooking (preferably longer): Soak 12 bamboo skewers in warm water for 1-4 hours. Slice chicken breasts into strips about 2” long and ½ “ thick. Place chicken pieces into a glass dish that has a lid. In a small bowl combine all the sauce ingredients and mix together until smooth. If using thick, solid peanut butter microwave ingredients for 30 seconds before mixing. Pour ¾ of the peanut sauce over the chicken in the bowl and stir until it’s evenly distributed, reserve the rest of the sauce to brush on the chicken while it is grilling. Secure the lid and let marinade for 30 minutes at room temperature, or longer in the refrigerator. Chop peppers into 1” square pieces. Place chopped peppers into a microwave safe dish and heat on high in the microwave for 4 minutes, or until they are soft to the touch but not fully cooked. Drizzle peanut oil over peppers and stir to combine. Alternate threading the chicken and peppers onto the skewers until you have used all of the ingredients. Be sure to try to keep the chicken as flat as possible so it cooks evenly. 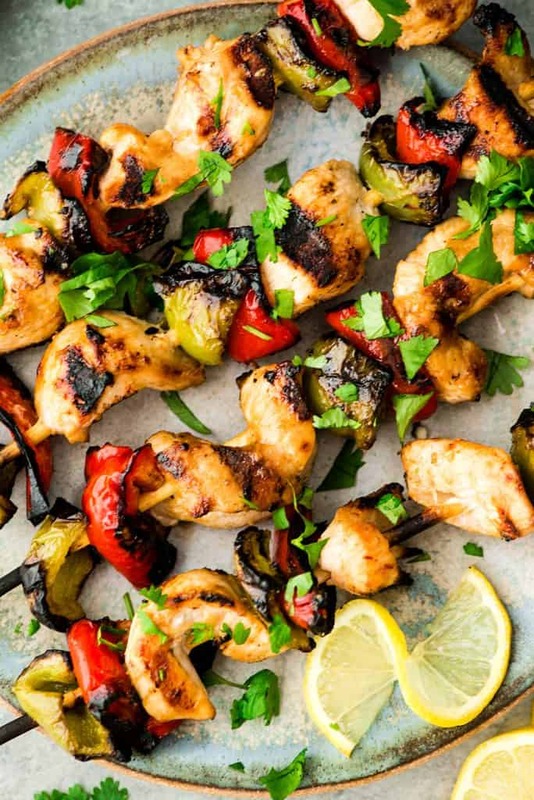 Place the kabobs on the grill and cook for 4-5 minutes on each side, turning them halfway through cooking. Use a meat thermometer to check for doneness (chicken should reach a temperature of 150 – 160 degrees Fahrenheit). Remove from the grill and serve immediately over rice or a salad!